Once again Ms. Carr brings her characters of Kali the nurse and mother, Theo her mute son, and Lincoln the man who saved Theo from being hit by a car, alive for us. This is the second installment in a trilogy.I found myself crying along with their frustrations, as well as cheering each victory--both small and large. Theo's first words and his excitement on the day that Kali loses her job because of her increasing blindness made you see frustration as well as the excitement and joy. The high for Theo and the low for Kali. The situations were handled realistically in the storyline, showing just how much in depth research was done by Ms. Carr on the medical aspect. Lincoln is the man who helps to bring Kali and Theo alive, while dealing with his own family demons. Each of them help the other while helping themselves. I would highly recommend this book, and look forward to the final installment in the series. I would also advise you to read the first installment so that you can appreciate the character development.I received an ARC in exchange for an honest review. Thank you Charlene for another wonderful read! As I have been reading Charlene's books, she has become an even better story teller. In this book, one is catapulted into the minds and thoughts of each main character so that if you met them on the street you would know them immediately and be able to start a conversation. Through her difficulties and disappointments, Kali holds on and meets her challenges head on. Lincoln faces his demons as well. My recommendation is that you must read this drama to see how they may or may not work together for a common good and where their choices take them. This book was very well written! I ran through many different emotions while reading it, including frustration that Kali didn't discuss her problems with people that needed to know. I can't imagine having to survive all that she goes through. I love that Lincoln and Kali are developing a romantic relationship, and I love how Theo is starting to overcome his muteness. I like that it doesn't happen all at once, it's much more true to life. 'What We See' moved me to tears on more than one occasion. I loved this book and couldn't put it down, I read it in one sitting. It is a must read...after reading the first book in the series so you can follow the story. I can't wait for the final book in this trilogy because they keep getting better! I was given an advanced copy so I could give my honest review. What We See is another true-to-life story from Charlene Carr. Her books are always thought-provoking and honest without fairy-tale endings, but there is hope and several possibilities for their futures. Her characters are so well developed they seem real and evoke emotions and feelings in the reader. The details on Kali losing her sight and everything that entails were illuminating. Lincoln also has problems but is a true gem who it is impossible not to root for. Marvin and Theo also capture our hearts. And what a cliffhanger! I voluntarily reviewed an ARC of this book. Charlene Carr did it again. Another thought provoking book that brought in many emotions. Characters were amazing and well developed,,,little Theo stole my heart. The second in the trilogy, I can't wait for the third! Wow, I really love this series. Powerful characters in sometimes heartbreaking situations. They stir both your thoughts and feelings. A bit of a roller coaster ride with strong emotions and a cliffhanger at the finish that makes you really want the 3rd book now. I was so excited to read this after loving the first book, but was wary of whether it would be as good and it was wonderful! I love these characters and I think the plot (with some difficult subjects to handle) was dealt with in a emotionally complex and very honest way. Heartbreakingly beautiful and I can't wait to read the next book in the trilogy! WOW! I flew through this book. The first book in the series I loved also but I found myself frustrated with the choices made by both Lincoln and Kali. But the author also makes you understand that there is so much more of the story to tell. We got a lot more in this one with a few surprises! Both Kali and Lincoln are slowly opening up yet still scared of getting hurt. Kali is finally letting her protective barrier down and their friendship is honest, warm and real. The story Charlene tells is sad, yet heartwarming and very well thought of. She doesn't jump the story quickly and unnaturally. I find that especially with Theo. He doesn't suddenly just start talking one day and then doesn't stop. He is still scared. You get the feeling this book was very well researched and thought out. I was very impressed and highly recommend this book. I find Charlene's character development better than other authors. She doesn't speed through details or history. It is so real and honest that I felt they were my friends and I can't wait to find out what happens next yet am also sad there are only three books! !I received an advance copy in exchange for my honest review. I always love to learn something when reading a book and from the looks of things Charleen has done a lot of research for this book. It is the second of a three part series What We See and is a continuation of the first book is Behind our Lives. These books feature Lincoln Fraser a loner who saves Kali's three year old son Theo from being struck by a car. Kali Johnson is a single mum who is a nurse and her three year old son, Theo has never spoken a word to his mother. Kali lands her dream job and then learns she has a brain tumor that is causing her to slowly loose her sight and her job. Lincoln offers to share his apartment with Kali and Theo even though she doesn't seem to want this relationship to be anything but friends.Kali has a father-in-law Marvin who after tragic events he withdraws from the world around him and essentially becomes a street person who Kali and Theo love but cannot seem to help.Lincoln is not who he appears to be, a down and out loner building a modern tree house in the middle of nowhere. We find out what happened to him and how he became such a recluse.Charleen Carr explores the heart ache of poverty, depression, and loss and how the actions of a two people can change everything.I can hardly wait to read the third bookThis is not a stand alone book so you really need to read the first book because it gives you a better idea of what is going on.I received a advanced copy of this book from the author in exchange for an honest review. 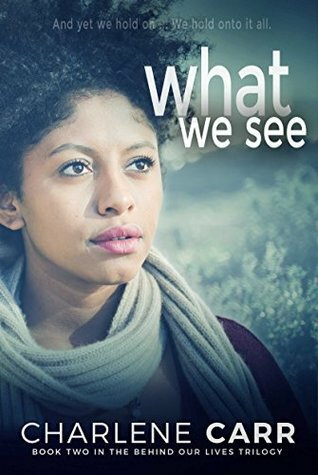 What We See by Charlene Carr is the second book in a trilogy. The first book, Behind Our Lives, left me anticipating the next part, and Ms. Carr does not disappoint! This second book of the trilogy is as compelling and beautiful as the first, and I was eager to immerse myself into the lives and tentative relationship of Kali and Lincoln. As Kali's life and world shrink, she is afforded an amazing opportunity to expand her heart. Lincoln is not just there for Kali, he is stepping up as a support for her son as well. Kali is walking a fine line of trying to make things easier for her son, and trying to shield him from the future darkness she faces.If you haven't ready Behind Our Lives, I urge you to read it first. Unlike some trilogy books, I feel this is truly connected and not just three stand-alone books. I received an advance copy of this book in exchange for an honest review, and I honestly loved it! The teaser at the end of What We See for the third book in the series certainly has left me looking forward to it. I couldn't wait for the second book to come out and I wasn't disappointed. Charlene writes in such a way that you quickly immerse yourself in the story. The development of the relationship between Kali, Lincoln and Theo was realistic and endearing. Charlene teaches as she weaves her stories. I wasn't ready for this book to end. This has been a great series and I can't wait for the next book! I highly recommend her. (I received an advanced reader copy of this book in exchange for my honest review. )In anticipation to this second book of her trilogy: What We See … Kudos to Charlene again for not disappointing us!Kali had some huge hurdles to jump in this story. In the first book I felt like I totally didn’t understand the character of Kali. She had a lot of “issues” and wasn’t sure how to live and get through them. Her attitude was kind of annoying, as she was determined to be too independent in raising her son. She depended on no one but herself and she struggled alone. With no place to go, she needed to trust Lincoln, yet she didn’t. As I read “What We See”, I discovered Kali’s reasons for why. It takes a bigger person to let others in when you have to. Whew! What a ride she is on! Lincoln sees this and steps up. Kali and Lincoln both need to be needed, trusted and loved for better things to happen. I am waiting patiently for the last story of this trilogy to see where everyone ends up … hurry … can’t wait Charlene! I just finished reading the ARC Book 2 - 'What We See' in the Behind Our Lives trilogy by author, Charlene Carr. Lincoln is even more of a 'Hunk' than I thought after reading Book 1. What a guy! This book continues on with the unusual circumstances surrounding Lincoln, who appears as a homeless street guy in Book 1, and Kali and Theo, a mother and son whom he meets as he attempts, and succeeds, in saving Theo's life from an oncoming car. I don't want to give any spoilers which will spoil Book 1 for those who haven't read it yet, but I want to say that, although I wasn't really highly impressed with Kali in Book 1 as a likable person, I now understand her so much better and love her too. It is also important to remember that this is a trilogy so there is obviously going to be some cliff-hangers in Books 1 and 2. We all know someone like Kali, someone vulnerable, someone afraid, someone in need, someone who needs a really good friend to be there for them while they work through some painful hardships. After reading Book 1 and Book 2, we will all wish that we knew someone like Lincoln living right next door to us. :) This book will help you to understand a medical issue that could confront many people sometime in their lives in one way or another, and the author has done substantial research in explaining the disease and the treatments used to help maintain and maybe even save the individual from more loss than anticipated. Kali's story will bring tears to your eyes, and you will yearn for a happy outcome for her, Theo and Lincoln, but will it happen?Theo, as in the first book, is an absolute delight in Book 2 and his development will make you smile over and over again as he progresses in age and development. I love this story, and look forward to seeing how these interesting characters will work out all the situations that are arising in their lives, and there certainly are some major concerns. Thanks to Ms. Carr for bringing us such an interesting, delightful and yet heart-wrenching story filled with both tears and smiles, and characters you will not forget any time soon. Already excited for Book 3 as this trilogy comes to an end. This was the second book in the series and I was given an advanced digital copy from the author for an honest review. I enjoyed this book for the most part. I love the characters and the main storyline but I felt like it was going in too many directions. I want to hear more about Lincoln and kali. Too much random details about the treatment and blind center. I also was extremely mad at the ending. Was it Dereck she saw? How are her and Lincoln? We needed more with that story. We are in book two now and they should be in a strong relationship by now for it to be believable. Don't get me wrong I still enjoyed the book but was frustrated at it going in so many directions. Like why did Marvin have the incident? We didn't need that for the story at all. Maybe consider staying more focused to the main story. Lincoln, kali and Theo would make a great family but it's dragging on. I was given an advanced digital copy...i really enjoy the continued story in this part two. I swear it has to be based on a true story with all the heartbreak,sadness and reality of sickness that strikes in real life. I am glad finally Lincoln and Kali are stepping forward in their relationship. i just love that little Theo. I think the ending of part two makes you want to buy part three. Thank you Charlene, aye!!! Glad I stuck around for the second book, the pacing is better, and all the characters experience a good amount of growth. Kali's motivations are a lot clearer in this book. Plus we are finally given a glimpse into the mystery that surrounds the story of Derek. I'm looking forward to book three. Something I hate about serial books is the feeling of loss. Charlene Carr writes such rich characters that finishing each book is like losing people I have come to love. These are not perfect people, but they are multi-dimensional and they begin to feel real during the reading. Charlene Carr - Bestselling Women's Fiction and Contemporary author Charlene Carr is an ardent lover of words. A voracious reader, when she needed punishment as a child her parents took her books away. These punishments were blessings in disguise - with nothing to read, she created her own stories. Currently, Charlene is focusing exclusively on novel writing and loving every minute of it well, almost every minute. There are days when her characters fight to have the story their way! (And they're almost always right. )Charlene lives in St. John's, Newfoundland, Canada and loves exploring the amazing coastline of her harbour town, dancing up a storm, and using her husband as a guinea pig for the healthy, yummy recipes she creates!